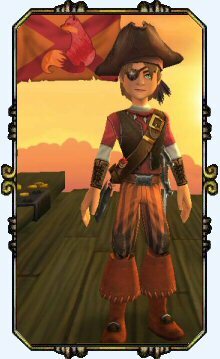 Aedan is my son’s first character in the public edition of Pirate101. He’s a recreation of all his beta pirates and he was born October 8th, 2012. Aedan Hawkins really fits my son’s interest in soldiers. Especially those from World War I and II. He has a great love of history and the invention of muskets, rifles and cannon through the ages. His favorite weapon at the moment is his musket. He saw the musket owned by Bonnie Anne and that inspired him to track this one down and make it his own. His first talent is being naturally spooky. Which also fits my kid well. He’s enamored with the Ghost Hunting app I have on my Android phone and is ready to go hunting with one of my friends Mr. Paul; who is a professional Ghost Hunter. 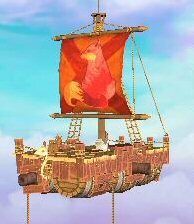 So I expect interesting discoveries from Aedan Hawkins and his travels through the pirate skies! 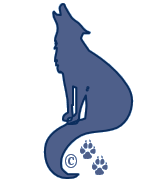 His ships flag is the sly and agile fox, where X marks the spot. Well now what other mark would a pirate have on his flag?! ‘X’ always marks the spot of treasure and riches beyond compare. So don’t let his nickname ‘clumsy’ fool you. This Captain’s greatest talent is his ability to sneak in like a fox, unseen, unheard and unnoticed. He’ll grab your treasures and be off in a flash, before you even know he’s been there. Aedan is currently a level 8 Swashbuckler. 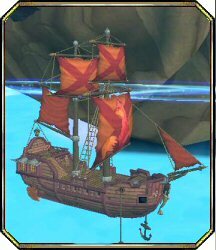 Aedan is currently Pirating in Skull Island with his first mate, Bonnie Anne. Keep up to date with his adventures through the Captian’s Log. Before he left beta he had acquired a nice skiff that once belonged to his parent. It was hard giving that ship up. But new adventures have brought new modes of travel. This go around he started out with a cute little raft with a better name than the first raft in beta, that one was The Lost Fool! Tso Phu –Ninja Pig – A gift from solving the clues on Marco Pollo’s Map. Spiny Bill Benchley – Cutthroat Pirate – A gift from the Cutthroat Bundle. 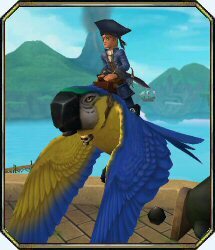 Large Parrot – He affectionately named Squawky. A reward from his early travels in the Beta Spiral. He has two homes for now. One for business and one for escape and relaxation.